I hope everyone had a Blessed Christmas. Thank you for all the nice Christmas gifts you and your child gave me. I truly appreciate them all, and your thoughtfulness is overwhelming. Again, Thank You!! As we begin the new nine weeks, we will continue to work hard in math. Your student needs to continue working on math facts whenever possible. We have made great gains, but need to keep working on multiplication facts as well as division facts. We will be starting a unit on fractions very soon.Thank you in advance for your help on this. In religion we will be working to prepare for the Diocesan Religion Test in May. We will continue with our regular religion studies as well. In reading we will continue working on parts of speech and reading with fluency. For science we are beginning a unit on earth science and for social studies, we will continue learning the regions of the country as well as states and capitals. Please sign your child's agenda each evening. As always, please contact me if you have questions or concerns about your child's classroom. It is hard to believe November is here already. I would like to take this time to wish all of you a Happy Thanksgiving! Your fourth-grader has been working very hard these few months. We were introduced to a new computer program called Success Maker that helps us with math and reading. Students have been very receptive and open to practicing their math and reading using this program. In science we are still working on Life Science, but should be wrapping it up soon. Social Studies has focused on the Southwest Region of our country, and we just began our study of the Southeastern United States. In Religion we are learning about living a virtuous life. We have also begun studying for the DRT which will be here before you know it. Math is all about multiplication of double-digit numbers. In language arts we are learning possessive pronouns, synonyms and antonyms, making generalizations, and drawing conclusions. As always, please contact me if you have concerns or questions about your child's classroom. 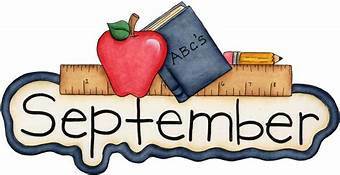 We are well into the new school year and time is flying!! I can't believe it is already mid-September. I have a great group of fourth graders, and I am proud to be their teacher! Your fourth grader has been working hard, particularly in math. We finished the AimsWeb Testing this past week, and also the placement tests for Success Maker and Moby Max. As I review results, I will have a much better picture of how I can help each of my students. I am also hoping my after-school math will be of help to the students who signed up. And, I would like to ask you, the parents, for some help in a couple of areas. First, I would ask parents to please look over and sign or initial completed homework each evening. Maybe this could be done at the same time you sign your child's agenda. I have several students who are not turning in their homework or who are turning in incomplete homework. Students are responsible to copy their assignments from the board into their agenda. I set aside time at the end of each day to do this. They are required to do this even if they have already finished the assignment. Secondly, can you spend a few minutes each evening helping your child review multiplication tables? It is critical that they know their times tables in order to be successful. Anything you can do to help me with this will be greatly appreciated. Thank you for your help on this!! Please feel free to contact me with any questions or concerns regarding your child's classroom. I am Karla McKinney and I will be teaching 4th grade at St. Jude this school year. I was happy to meet several of you during registration and at the ice cream social. I taught 5th grade at St. Peter Schulte for eleven years, and am looking forward to being here with your fourth graders this year. I will work very hard to be a good teacher and role model for your children. With your help, I am confident we will have a very happy and successful school year. Fourth graders will work very hard in Math, and I will do my best to help them be successful. We will learn multiplication and division, fractions, and measurement. In English Language Arts we will of course read literature as well as informational texts. We will improve our comprehension and expand our knowledge of word meanings, prefixes, root words, and spelling. Fourth grade Social Studies focuses on the 50 American states. In Science we will learn about energy and fuel; structure, function, and information processing; and earth's systems. And, in Religion we will deepen our understanding and knowledge of our Catholic Faith while preparing for the Diocesan Religion Test late next spring. I would ask that you please sign your child's agenda book each evening. It can also be a useful tool for short messages back and forth when needed. I will also correspond by telephone, as that is much quicker as well as more personal. Please do not hesitate to contact me with questions or concerns about your child's classroom. I will be here each day at least until 4:00 pm. I look forward to a successful school year.